Alameda police issued a warning and are seeking the public's help in identifying a peeping Tom who was caught on camera in the East Bay city. 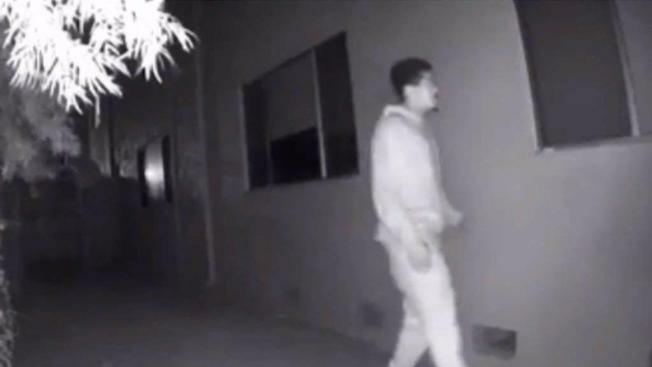 The suspect was captured in surveillance video peering into windows at homes between the 1600 and 1800 blocks of Santa Clara Avenue in Alameda, police said. The incidents were reported over the course of Sept. 9-14, between 11 p.m. and 7 a.m. In all the incidents, residents were home and spotted the suspect, who then fled the area. Police are actively investigating the case, saying it's a scary situation, and they want the suspect caught. Resident Marie Latourelle said she is taking the police department's warning to heart. It’s very concerning," she said. "I think that’s what we’re going to do after this is go review my few days of nighttime cameras to make sure it hasn’t happened at our house." The suspect is described as a light-complexion male, between 20 and 30 years old, standing 5 feet, 8 inches to 5 feet, 10 inches tall, 160 to 180 pounds, with dark hair. Anyone with information may contact the Alameda Police Department at 510-337-8340.